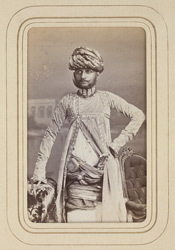 WANKANER: Bane Singh, Raja Sahib of Wankaner (1842-1881). bl.uk > Online Gallery Home	> Online exhibitions	> Asia, Pacific and Africa Collections	> WANKANER: Bane Singh, Raja Sahib of Wankaner (1842-1881). Three-quarter length standing carte de visite portrait of Bane Singh, Raja Sahib of Wankaner (1842-1881), from an 'Album of cartes de visite portraits of Indian rulers and notables' by Bourne and Shepherd, early 1870s. Wankaner, in the Saurashtra region of Gujarat, was a princely state whose ruling family that belonged to the Jhala Rajput family. Benisinghji was born in 1842 and succeeded in 1861. On his death in 1881, he was succeeded by his son Raj Saheb Gangubba, who was minor and the state was administered by a Government Karbhari until his maturity.